When the subject is race, people shut up. They don’t want to talk about it, especially in mixed company. Few seem willing to speak openly or candidly, for fear of being called a racist. And as a result, questions and answers, issues and problems, simply don’t get discussed thoroughly and honestly in America today. Instead, ignorance festers, fear grows, stereotypes persist, segregation increases. The Experiment in Black and White is a concept designed to help change all that. And it’s a proven concept—one that won a national Emmy and Edward R. Murrow award. It’s a concept that the creators of the original documentary project believe is ripe for re-envisioning. 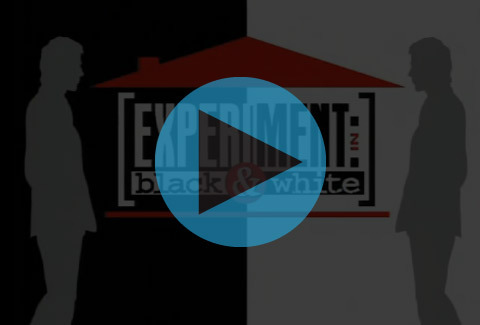 As can be seen in the clip above of the original version of this documentary proposal, this Experiment brought five black and five white Chicago-area residents (all strangers to one another) together for one week, sequestering them inside a home. They lived, ate, slept, socialized, and debated race-related issues with one another. The participants were given daily assignments and tasks, designed and facilitated in part by professors from the University of Illinois, Northwestern, DePaul, and other schools. They conversed about everything from slavery reparations and racial profiling, to affirmative action and the use of the ‘n’ word. There were talks about discrimination and crime, language and behavior, cultural and sociological perceptions—and misperceptions. The conversations were eye opening, provocative, and sometimes controversial. Yet they were also rational, meaningful, and substantive. In the end, much of what was expressed publicly by these participants often echoed the views of the general public–opinions and feelings many people may voice privately but fear or resist saying aloud because of the potential repercussions in our “politically correct” culture. In The Experiment in Black and White, the housemates were refreshingly and sometimes stunningly honest. There was no tiptoeing around any issue whatsoever. Though all arrived ready to defend their strong opinions, they were also willing to change them if convinced otherwise. Some issues were definitely not resolved, but it’s safe to say that everyone involved in this project gained a better understanding of one another. Each person worked diligently towards bridging the racial divide. Community reaction to the 2001 version of The Experiment was overwhelming. Educators from hundreds of churches, schools, universities and workplace human resources departments throughout Chicago–and even across the nation—wanted copies of the program to use in race relations, racial diversity, conflict resolution, psychology, and sociology classes. The participants spoke about the project on radio stations, in newspapers and magazines. Two years later, a sequel of sorts was produced to equal acclaim: Experiment: Gay and Straight. After its local television debut, it was accepted into, and shown at 22 international film festivals. OK, SO WHY DO IT AGAIN? Simply put, the original Experiment electrified TV screens, and its message is clearly needed once again. Even though African Americans can now proudly look to the first black president for leadership, every day there are new reports of a growing, race-reflective economic and educational divide in the United States. Many of our cities remain steadfastly segregated. This Experiment deserves to be revisited and re-made, with a whole new set of participants. The Reporters Inc. has held discussions about the project with American Public Television and the National Endowment for the Humanities, as well as local PBS stations from Maryland to Houston. All have expressed interest, and a desire, to support and help air a new Experiment in Black and White. 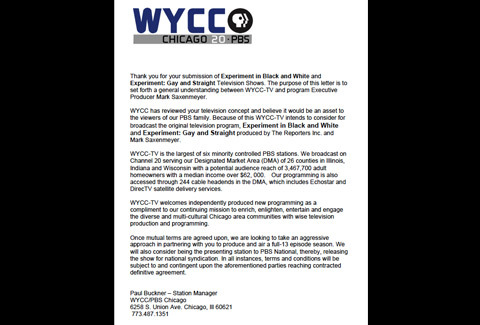 In fact, WYCC-TV (PBS) in Chicago has committed to taking “an aggressive approach in partnering” with The Reporters Inc. to potentially produce not just a single documentary, but an entire 13-episode season of The Experiment. WYCC also promises to seek public television distribution through PBS, ITVS, or APT. While national distribution of a Chicago-based Experiment with Chicago-area residents is indeed desirable, the ultimate goal of The Reporters Inc. is to duplicate the concept in any number of American cities, specifically catering the subjects and issues discussed to each populace’s needs and concerns. For The Experiment in Black and White to be fully conceptualized, it needs to be distributed as a learning tool for children at school, and adults at educational workshops. The Reporters Inc. will work to develop supplemental print and web-based study materials in accordance with this mission. The most important part in putting together this kind of project, once again, is the selection of the participants. They need to be smart, articulate, engaging, uninhibited, and unafraid to voice their opinions—informed opinions. They also need to know how to listen, and be willing to learn. Most importantly, though, it’s essential to weed out closed-minded bigots or zealots with specific agendas–or this Experiment simply won’t work. So, to find our participants, The Reporters Inc. hopes to announce the project through the airwaves and website of the participating media outlet(s), as well as here on our website, www.thereporters.org. The utilization of Twitter and Facebook will be integral as well. The Reporters Inc. will seek a broad range of voices from varied educational, socio-economic, and religious backgrounds—of different ages and sexes. 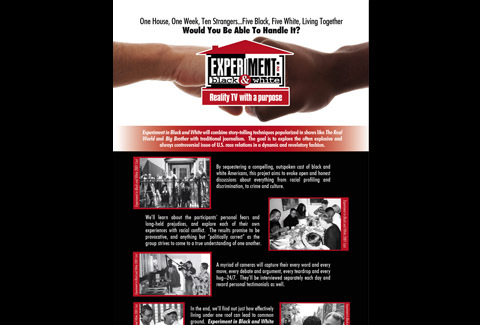 The Experiment producers will again assemble a panel of some of the most prominent and experienced race relations experts (from schools, universities, race relations organizations, etc.) to help select the participants, and help create and guide the discussion agendas and materials. Is it really necessary to rope the eventual participants from their normal, every day lives? Absolutely. For example, if this project were to instead ask participants to meet for, say, eight hours a day but dismissed them to return at night to the safe haven of their real homes, the outcome of the Experiment would most likely be far different. If allowed to vent to their friends and family—people who most likely share their long-held beliefs–that allowance would simply help them further enforce and solidify their pre-Experiment opinions. It would be detrimental to the mission at hand. In The Experiment home, this new makeshift family will have no choice but to keep talking, keep learning, and continue evolving. And when all the other aspects of living together are thrown into the mix, like sharing a bathroom, or making dinner, or playing cards, the contentious issues and animosities ease into the background as the participants get to know each other on a personal level. As they share stories about their children, hobbies, jobs, and travels, the discussions about race will then take on a different perspective. Differences will remain, but a deeper appreciation for each other can grow. The mere mention of race relations is an automatic turn-off for some, due to the stale, dull and redundant media explorations typically presented. Yet the compelling and thought-provoking nature of The Experiment in Black and White seeks to attract a whole new crop of viewers to the subject matter—viewers who, in the end, might just be encouraged to scrutinize their own belief systems and thought processes. The Experiment in Black and White promises to be a fresh voice and an intriguing alternative, delivered with integrity, and poised to redefine the parameters of substantive journalism. With your help and support, we can make it a reality.